Rugby World sat down with Wallabies legend George Gregan to discuss his views on the game of sevens and just how difficult it is to make key decisions in the heat of a tough sevens fixture. The former scrum-half speaks of his admiration for the sevens athletes, explaining that during a hard fixture “you counter punch, and you feel that you’ve got them on the ropes, but you need an extra effort. You need that from yourself, you need that from the players around you and you need to call upon that. As well as talking through decision-making, Gregan also singles out New Zelaand stalwart DJ Forbes for praise, as well as talking of his admiration for Samoa’s Phoenix Hunapo-Nofoa. 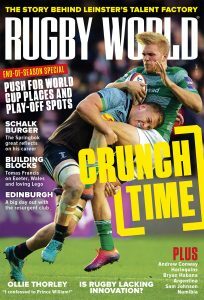 There is sevens coverage in every issue of Rugby World magazine. For the latest subscription offers, click here.